The International Space Station has hosted more than 230 astronauts over the years, and now it’s set to host its first floating robotic head. 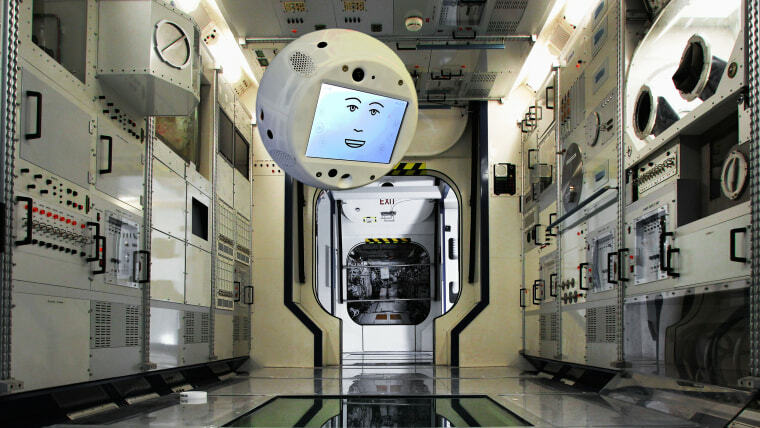 A ball-shaped robot known as CIMON — that’s short for Crew Interactive Mobile Companion — will join German astronaut Alex Gerst when he and his crewmates rocket to the ISS this June. Roughly the size of a medicine ball and weighing about 11 pounds, CIMON is designed to accompany and assist Gerst and his crewmates as they move about the ISS. The bot was built by aerospace giant Airbus and runs a version of IBM Watson’s artificial intelligence. It has a video-screen face that gives it a hint of personality, along with a camera and digital voice that let it talk with the astronauts as they perform experiments — and answer questions that crop up. “Think of it as Space Alexa,” reads a post about CIMON on the website of Airbus, which is developing the robot on behalf of the German Aerospace Center. Though it’s only a bot, CIMON can respond to situations with something like emotions — happiness if a task goes well, for instance, or surprise or even fear if things don’t go exactly as planned. It’s programmed to recognize Gerst, who was given a hand in selecting CIMON’s voice and its face as a way to foster their budding friendship. The ISS has never seen anything like CIMON, but it won’t be the first robot to visit the station. In 2008 the Canadian Space Agency sent up Dextre, a two-armed robotic “handyman” that on Earth tipped the scale at 3,440 pounds. In 2011 NASA sent up Robonaut 2, the first humanoid robot to fly in space. Dextre is still on the job, but Robonaut 2 was recently brought back to Earth to address problems with its performance. If CIMON does well, it may wind up with assignments on Earth. Dr. Judith-Irina Buchheim, a physician at Ludwig-Maximilians University Hospital of Munich in Germany and an advisor to the CIMON project, said the robot could be used to provide support to doctors and engineers and help care for elderly people living alone.